What Holidays Should Your Business Take Part In? It’s that time of the year again when the seasons change and your customers shift into holiday shopping mode. For retailers, this is easily the most profitable time of the year. Between Labor Day and Christmas, your customers will spend tens of thousands of dollars buying gifts for their loved ones. But if it is lucrative, it is also equally challenging. Figuring out what holidays to focus on, what holidays to ignore, and what promotions to run can tax even seasoned retailers. To help you out, we’re going to look at 6 major shopping days between now and December and tell you which holidays your business should take part in. Altogether, customers in the US alone spent $708.8 during the holiday season (including back to school and Halloween). This is as overwhelming as it is profitable. So let’s look at each of these 6 holidays to see if they are worth your time. The Labor Day is just around the corner and is the unofficial start of the holiday shopping season. Celebrated on the first Monday of September (which happens to be on the 5th this year), this day honors the American labor movement. Since it falls on a Monday, people get a long weekend with three days away from work. More importantly, the Labor Day is considered the unofficial end of the summer season. This is when school and sports (such as football season) kick-off again after a long break. Because of this, Labor Day is particularly popular for back to school sales. The Labor Day is closely associated with back to school shopping. While there are plenty of promotions on Labor Day itself, most sales you’ll see this weekend would have started slightly early to capitalize on back to school/college customers. Statistically speaking, this is next only to the holiday season (mid-November to Christmas) in terms of total sales. 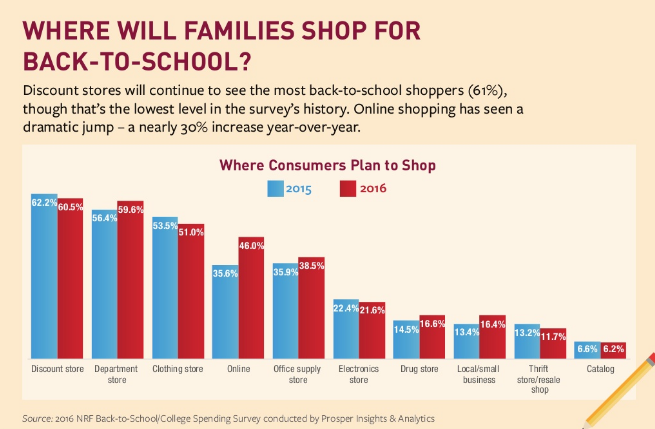 According to a NRF survey, total spending on back to school/college will be $75.8 billion. For back to school, this will be $27.3B. For back to college, this figure will be $48.5B. Families with children in high school spend the most with an average of $682.99 per family. Those with children in elementary school spend just $580.94 in contrast. Electronics account for the largest share of back to school spending with families spending an average of $212.35. As expected more shoppers say that they will be shopping online than the year before. In fact, online sales have jumped nearly 30% YoY. Should you participate in Labor Day sales? The Labor Day has become intertwined with back to school sales. This includes stationery, clothing and office supplies you’d normally buy your children before they go back to school or college. While you can certainly promote other items (such as furniture or home furnishings), you’ll see maximum traction if your promotions focus on back to school customers. Else, it might be a good idea to reserve your marketing budget for the upcoming holidays after Halloween. Labor Day discounts are beginning to start days — even weeks before the actual Labor Day. 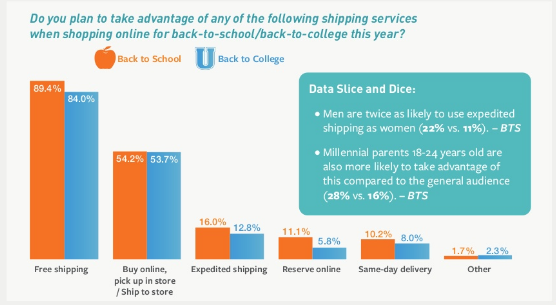 As per NRF, a growing number of families are starting their back to school/college shopping three weeks to a month before school actually starts. By starting early, you also have the option to run early bird promos and get rid of unwanted inventory. As per a NRF survey, 84% of parents say that they won’t shop online without free shipping. 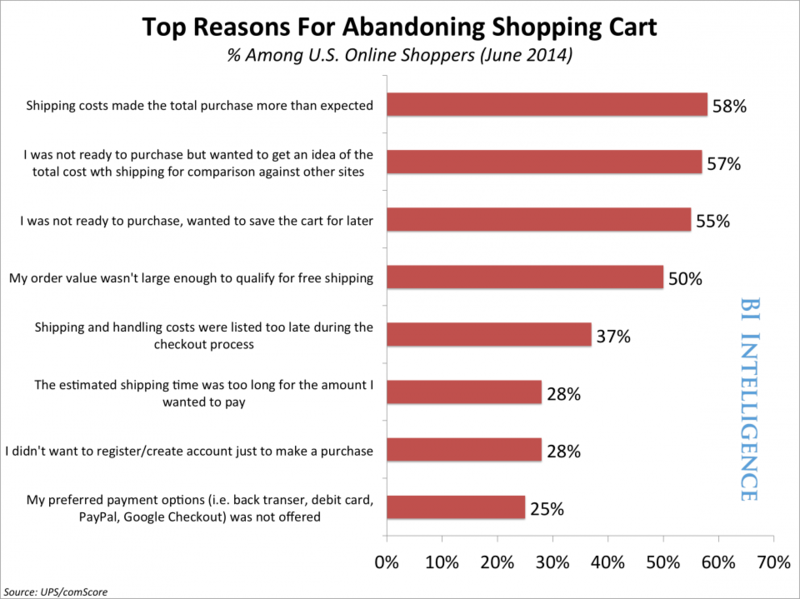 Shipping is already one of the biggest causes of shopping cart abandonment. Given these facts, it would be a good idea to offer free shipping with your promotions (or at least offer it above a threshold figure). As per another NRF survey, over half of the shoppers would like to buy online and pick-up the purchase in-store. If you have a physical location, consider offering this service. You can use Ecwid apps such as the In-Store Pick Up app to streamline this. 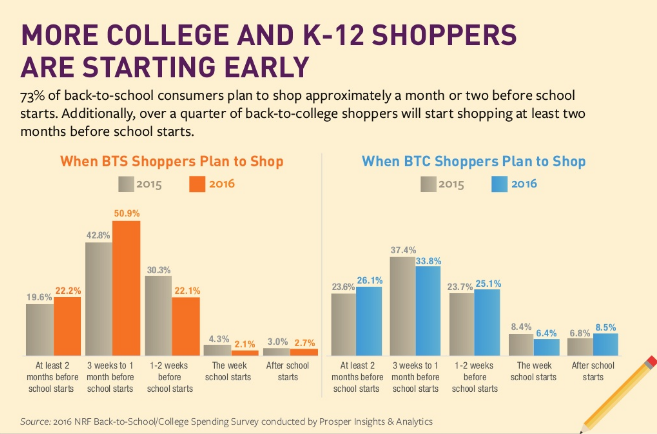 As per a NRF poll, 24% of families procrastinated on their back to school shopping. If they did, they focused more on buying essentials — pens, notebooks, stationery, etc — while delaying buying non-essentials such as clothing and electronics. If you are running promotions, consider discounting your back to school essentials earlier. From a relatively obscure holiday with uncertain origins, Halloween has turned into one of the most important days in the year, for retailers and consumers alike. Halloween culture, from trick-or-treating to costume parties, promotes consumption. Obviously, this makes it a great day for retailers. According to a NRF survey, total US spending on Halloween in 2015 was $6.9 billion. Considering that 157 million Americans celebrate this festival, this works out to an average spending of $74.34 per person. 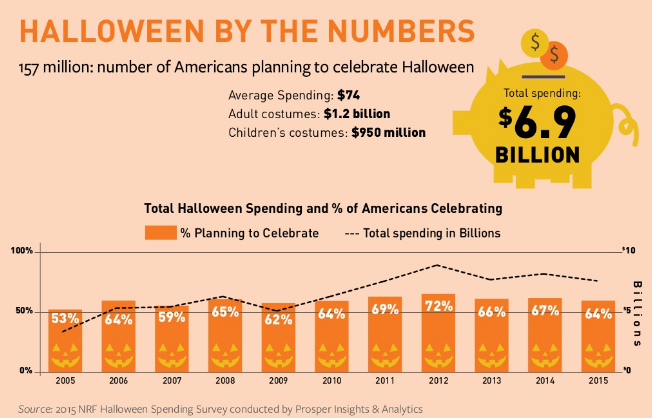 On average, Halloween spending has remained stuck around the same mark over the years. In 2014, for instance, total spending was $7.4B. Interestingly enough, younger shoppers tend to be more enthusiastic about celebrating Halloween. 81% of millennials (18-34 demographic) were planning to celebrate Halloween in 2015. 68M Americans planned to dress up in a costume on Halloween (roughly 43% of all 157M Americans who celebrate Halloween). More than 70% planned to hand out candy. More than 45% planned to decorate their house. There’s a growing trend of people buying costumes for their pets as well. Nearly 13% of shoppers in 2015 said that they would dress up their pets in a costume. However, this figure is much higher for millennials — 20% said that they would buy costumes for their pets. Halloween shopping begins early enough — as per NRF, 40% of shoppers start their shopping within the first two weeks of October. Should you take part in Halloween? The majority of Halloween shopping revolves around candy, decorations, and costumes. Younger shoppers are far more likely to celebrate and spend money on Halloween than their older counterparts. While some retailers do run general-purpose promos on Halloween, it still remains a holiday largely reserved for certain segments. If you are not selling costumes, candy, or anything spooky, it might be wise to sit this holiday out — at least in terms of actual discounts. However, Halloween does present a fantastic opportunity to brand your business. Even if you don’t offer extensive discounts, you can use Halloween themed designs, contests, etc. to build up your brand, especially among millennials. Halloween is a very experiential holiday that has developed its own iconography. From your decor to your sales, try to incorporate elements that evoke the spookiness of Halloween. This can be as simple as offering a steep discount on an Adams Family style evening dress to an elaborate Halloween-themed promo. In order to build up the mood for Halloween (and the holiday season beyond), you can try marketing tactics like handing out free bags of candy with customer purchases. It doesn’t set you back by much and gets customers in the spirit of Halloween. From offering free trick or treating bags (with your logo on it, of course) to scariest costume contests, focus most of your promos on the Halloween theme itself. Use Halloween as a branding tool and you’ll do phenomenally well. The day right before Black Friday when Americans gather to offer thanks and spend time with family. Thanksgiving is one of the most important holidays in the year. It’s especially important for retailers as they move into Black Friday and Cyber Monday. Should you run promotions on Thanksgiving? If yes, what kind? As far as numbers go, Thanksgiving isn’t exactly a big shopping day. According to Adobe Digital Index, customers bought $1.73B worth of goods online and $1.8B within stores on Thanksgiving day (i.e. Thursday). This shouldn’t be surprising — Thanksgiving is a day for spending time with family, not shopping. Most people wait for Black Friday and Cyber Monday deals for their shopping. A majority of shoppers (51.6%) bought clothes on Thanksgiving Day. 32.8% bought toys, 31.9% bought books and DVDs, and 32.8% bought electronic items. 32.5% of shoppers said that their shopping decision was influenced by sales and promotions. 61.1% of 18-24-year-olds and 60.2% of 25-34-year-olds reported showing up at the store at or before midnight on Thanksgiving Day to shop (right after the traditional dinner). Should you participate in Thanksgiving promotions? Thanksgiving has traditionally not been a shopping day. However, as retailers have moved sales earlier to stand out on Black Friday, more and more customers are starting their shopping on Thanksgiving Day or even earlier. Participating in Thanksgiving Day promotions is a mostly a matter of convenience. You’ll in all likelihood run extensive promotions on Black Friday and Cyber Monday anyway. If you have the resources to handle it, it won’t hurt to start promotions a day earlier on Thanksgiving. As mentioned before, retailers are moving their promotions earlier in the week to better compete on Black Friday. In fact, according to one survey, nearly 57% of shoppers started their shopping in early November itself in 2015. Thanksgiving is followed by Black Friday, which is followed by Small Business Saturday and Cyber Monday. This is the most profitable time of the year for most retailers. If you want to maximize revenues, focus your promotions on the whole weekend, not just Thanksgiving. Thanksgiving is a fantastic time to build customer loyalty and humanize your brand. Think of sending your best customers thank you notes. You can even position a sale as a way to thank your customers for their business. Thanksgiving is about giving thanks after all. Black Friday is the most important day in the retail calendar — and for good reason. This is the day most retailers make their profits (and go into black — hence the name). However, for online retailers, there’s another day that’s quickly replacing Black Friday — Cyber Monday. This brings up an obvious question: do you really need to participate in Black Friday? 151M shoppers opened their wallets for Black Friday deals in 2015. Of these, 103M shopped online with roughly 42% consumers shopping online only. According to Adobe, total online sales on Black Friday topped $2.72B — up 14% from the year before. 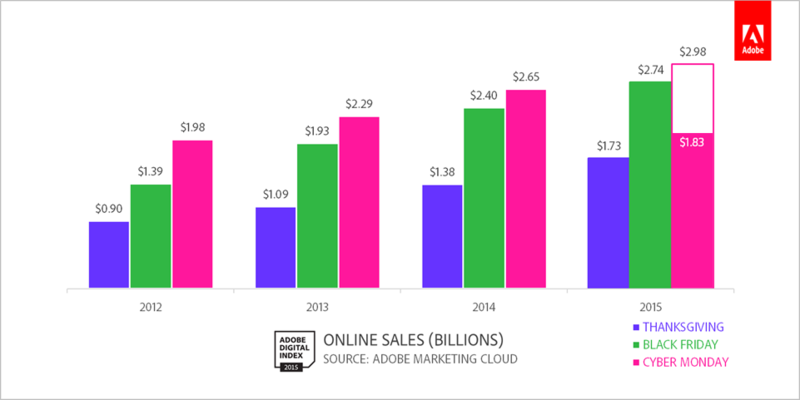 Interestingly, Adobe said that 34% of online sales came from mobile, a significant (and growing figure). Should you participate in Black Friday promotions? Despite competition from other days, Black Friday remains one of, if not the most important shopping days of the year. Interestingly enough, while Black Friday used to be a one-day only sale, more and more retailers are offering deals starting from Halloween itself. With the addition of Cyber Monday, Small Business Saturday and Free Shipping Sunday, the entire weekend has turned into a large shopping event. Which means that unless you plan to sit out the entire November 25 weekend, it would be a good idea to at least do some promos come Black Friday. As per NRF, 8 out of 10 shoppers had gift cards on their shopping lists last year. Over the entire year, shoppers spent $31B on gift cards. With Christmas just around the corner, it’s a smart idea to offer gift cards on your store. The shopping season can be hard to navigate for consumers, especially with hundreds of deals clamoring for their attention. Help them figure out what to buy by curating your best deals with gift guides. You can curate deals by price, category or interest. Black Friday is a big hit on social media. According to ReadyPulse, 1.4M tweets were sent out in 2015 mentioning Black Friday. Try running social media heavy promotions before the shopping weekend. For example, in 2014, Target offered new Facebook fans gift cards for engaging with the brand. A major chunk of your Black Friday weekend sales will come from email (25.1%, as per one study). However, instead of simply sending a promo email on Friday, build up anticipation by sending customers a stream of emails from the week before. Your customers should have zero doubts about the deals you’re offering on Black Friday. Oh and make sure that your emails are mobile optimized. As per one study, 76% of Black Friday emails were opened on mobile devices. You can use the Mailchimp integration in the Ecwid store to send timely, mobile-optimized emails. Cyber Monday is a relatively new addition to the shopping calendar. It was first used in a Shop.org promotion in 2005. Eventually, it was adopted by other retailers and has now become a part of the Thanksgiving weekend. Cyber Monday is almost exclusively an online-only shopping event. While you might be able to find some deals in stores, nearly every significant sale will be online. As an E-commerce store, participating in this day is almost a given. Consumers spent $3.07B on Cyber Monday shopping last year, up 16% from the year before. This made November 30, 2015 the biggest e-commerce sales day ever, beating the record held by Black Friday in 2014. 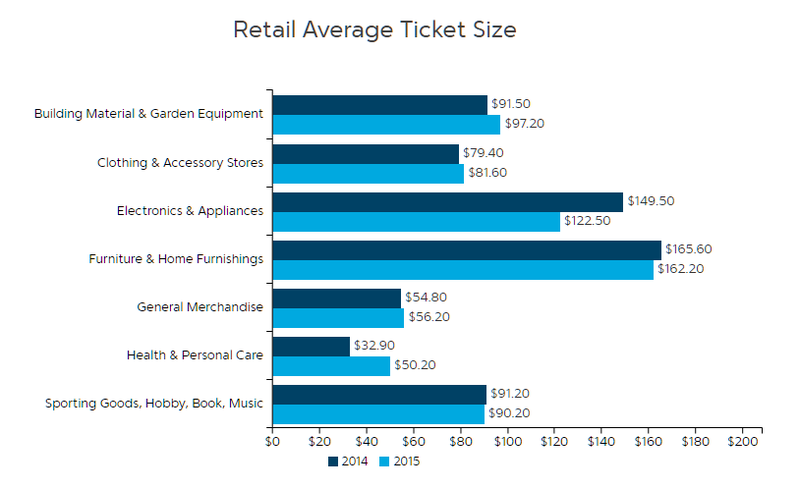 On average, customers spent about $124 on average. Total number of shoppers in 2015 was estimated to be 121M. Of these, roughly 24.4% said that they would shop on mobile devices. According to Adobe Digital Index, the trend is clear: Cyber Monday sales have risen significantly YoY, rising from $2.65B in 2014 to an estimated $3.07B in 2015. 76% of all online shopping also goes to just 1% of products — electronics (60%), gift cards (10%) and toys & apparel (30%). 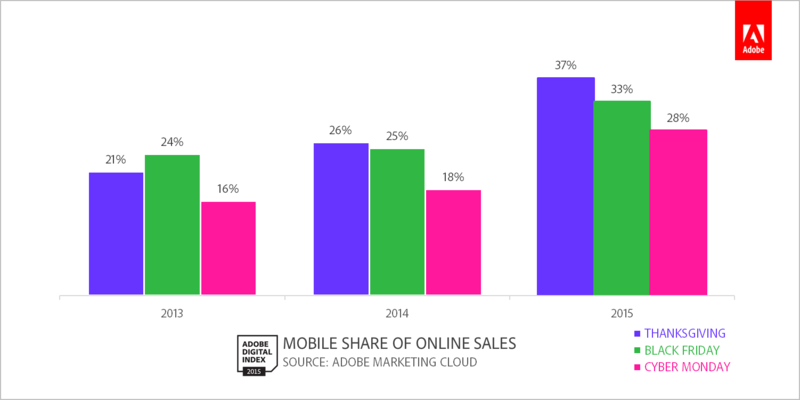 The mobile share of online sales is also increasing fast, going from 18% in 2014 to 28% in 2015. Should you participate in Cyber Monday? Cyber Monday is quickly replacing Black Friday as the shopping day for online shoppers. This is particularly true for retailers selling electronics, apparel, and toys. The only reason you wouldn’t want to participate in Cyber Monday is if you’ve already exhausted your stock on Black Friday. Customers landing on your site should know immediately that you are running Cyber Monday promotions. As shown above, the mobile share of Cyber Monday sales is rising rapidly. In fact, in terms of site traffic, mobile and tablets eclipsed desktops in 2015. If you want to win on Cyber Monday, make sure that your store is mobile optimized and that all your promos (including email) work on mobile-first. According to Adobe, 14 out of every 100 products a customer sees on Cyber Monday is out of stock. In fact, out of stock product rates more than double the normal rates on Cyber Monday. Make sure that you have plenty of products in stock before the shopping day starts. There is zero doubt about this: the Christmas season is the biggest shopping season of the year. The Christmas tradition of giving gifts to loved ones means that shoppers spend an enormous amount of money in the weeks leading up to Christmas day. Participating in Christmas season should be taken for granted for any retailer. Nevertheless, let’s take a look at the numbers associated with this season to better understand what customers spend on. Traditionally, the Christmas shopping season is supposed to commence the day after Thanksgiving. This includes Black Friday and Cyber Monday as well. 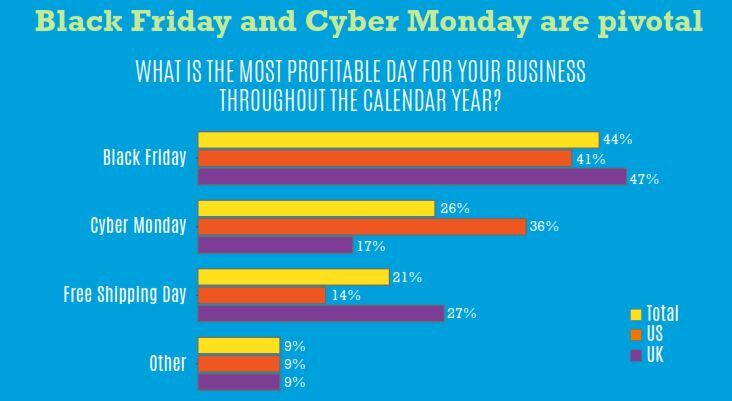 Most holiday season sales statistics, therefore, include these days as well. 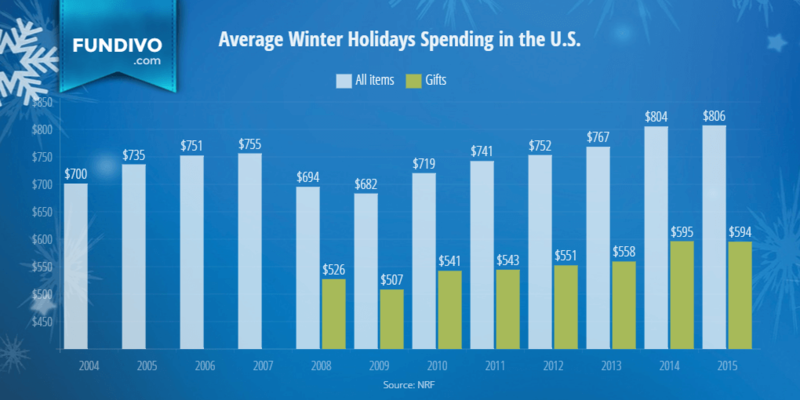 According to NRF, shoppers spent $626.1B over the winter holidays (including the two days mentioned above). Online shopping accounts for an increasingly larger portion of this shopping pie. Last year, between Black Friday and Christmas Eve, online shopping increased by 20%, accounting for 10% of all retail sales. On average, customers spent $806 per shopper during this season. Of this, $594 or nearly 74% was spent just on gifts. NRF data also indicates that a growing number of customers are holding off on their holiday shopping. Last year, roughly 15% of shoppers say that they hadn’t even started their shopping by December. In fact, Super Saturday — the last Saturday before Christmas (December 19 last year) — saw $15B in retail sales. This was higher than total sales on Black Friday, suggesting that people are shopping later than ever. Overall, the holiday season accounts for 19.7% of all retail sales for the year. Should you participate in Christmas promotions? Yes and yes. Christmas shopping isn’t just about promotions; it is also about traditions, branding, and customer expectations. Not only will Christmas promos bring in a huge chunk of your annual sales, it also gives you a chance to thank your customers and take part in the Christmas spirit of giving. It doesn’t matter what kind of store you run, participating in Christmas promotions is a must. As mentioned above, shoppers are increasingly holding off on purchase decisions, sometimes as late as Super Saturday. Instead of stopping promotions after Cyber Monday, it’s a good idea to keep them running all the way up to New Year’s Eve. Christmas shopping is all about buying gifts for friends and family (74% of all purchases). Free shipping is a big motivator in making these purchases. Try to offer free standard shipping for all customers until Free Shipping Day (December 18) so your customers can receive their gifts by Christmas eve. Curating your best products in the form of gift guides is a must for Christmas season. Remember that a majority of your customers will be shopping for others, not themselves. Being able to sort through products and find the right gift is crucial for converting customers. Use Christmas iconography (snow, Santas, etc.) in your marketing collateral to give your brand a Christmas makeover. And while you’re at it, make sure to thank your customers and give them something for free to partake in the Christmas spirit. This was a long post, but hopefully, you now have all the data you need to decide which holidays to participate in. Labor Day:Focuses mostly on back to school sales. Participate if you are selling products that would appeal to millennials and parents of millennials. Halloween:Most sales focus on candy, costumes and Halloween decor. Not suitable for every business; use it mostly as a tactic to get people to your site. Thanksgiving: Thanksgiving is becoming an increasingly more important shopping day. Kickstart your holiday season sales by offering discounts starting from Thanksgiving. Black Friday:Black Friday is a crucial shopping day; taking part in it is almost a given. Cyber Monday:Cyber Monday is the shopping day for e-commerce stores. Participating in this is a must. Christmas:The period between Thanksgiving and Christmas is the biggest shopping period of the year. If you sell items that are giftable (i.e. electronics, clothing, toys, etc. ), this is arguably the most important period for your business.